when laying flat excluding handle length. Stitches: ch, sc, sl st, tr. Round 1: Ch1, turn. Sc in ea st and in ea row end around, placing 3sc in ea corner. Join with a sl st in the 1st st. Round 2: Ch1, do not turn. Sc in the Back Loop Only of ea st around. Join with a sl st in 1st st. Round 3: Ch1, do not turn. Sc in ea st.
Ch1, do not turn. Sc in next st, place marker. Sc in ea st around, repositioning the marker at the beg of ea new rnd. Continue until you have completed 24 rounds. Sl st in next st.
R2: Ch1, turn. Sc in next st.
(Tr in next st. Sc in next st.) across. R3: Ch1, turn. Sc in ea st.
R4: Ch1, turn. Sc in the 1st st.
Tr in the next st.
Sc in ea st across to last 2sts. R5: Ch1, turn. Sc in ea st.
Rs 8-23: Alternate repeating R4 & R5. R25: Rep R5. Do not fasten off. R1: Ch140. Sc in the hump of the 2nd ch from the hook. Sc in the hump of ea rem ch. Rs2-4: Ch1, turn. Sc in ea st.
Holding the Flap with the bumpy side toward the purse, center the flap on the purse and sl st cor sts tog to join. 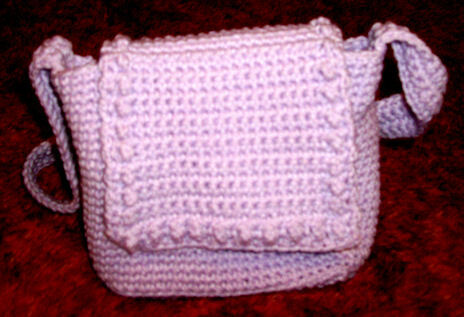 Using a yarn needle, sew the handle to the sides of the bag. Use a yarn needle to weave in the yarn tail.